I always wanted CADABLOG.COM but it wasn't available when I started this site. The company that owned it stopped renewing it so it was available and I got it. It's mine and you can use it to get here. It's much easier to remember and to type. I've always hated the hyphens, but at the time it was all I could get. You can use that URL as well. Regardless of how you get here, I hope you enjoy the content. AUGI January HotNews is out! I have two articles! The AUGI (Autodesk User Group International) HotNews January edition is out. It's been a while since I had an article in HotNews but this month I actually have two! 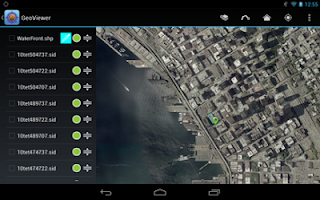 LizardTech releases free GeoViewer app for Android. LizardTech has had a free image viewer for desktops (GeoViewer) for some time now. Now they have released a free version of their viewer on the Android platform through the Google Play Store. GeoViewer is a simple viewer that can handle MrSID and JPEG 2000 images. Users can pan and zoom to navigate the images. You can also add vector layers like Esri Shape files and KML Files. The app lets users measure distance between points, between a point and your current location (if your device’s GPS is enabled) or along a path of points. GeoViewer can see geocoordinates of any location by touching that place on the screen. Users can look at layer properties, the coordinate reference system being used, the layer’s geo bounding box, dimensions, colors pace, data type and resolution. Users can also search locations by geographic coordinates in WGS84 (Lat/Long) or in the images native coordinate system. If Autodesk doesn't make a Windows Phone 8, or Windows 8 App store version of AutoCAD WS (and their other apps) they will miss the boat. Windows is not going away any time soon. Windows Phone 8 is not that big of deal right now but it is growing. The thing about Windows Phone 8 is that it works very well with other Microsoft software like Microsoft Exchange and Microsoft Office. Many AutoCAD users use many Microsoft Products (like Office and Exchange.) Windows Phone 8 will get adopted, how much, I have no idea. In the U.S. it only has a small market share (at the moment) but it is growing. Windows 8 will eventually replace most of Windows XP, Windows Vista and eventually Windows 7. Honestly that may not happen until Windows 9 comes out, but you get the idea. Windows, for the moment, is here to stay in the enterprise and in small business.